Heavy duty tables and solid picnic tables for public and commercial areas. For full pricing on all our products simply select the appropriate left hand menu options. Commercial grade 'A' frame picnic tables are by far the most popular outdoor furniture item in parks, gardens and caravan sites. 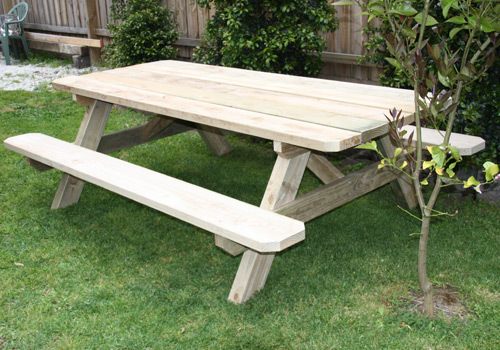 We have the best range, quality and prices in Melbourne on solid picnic tables for commercial and public areas. Our commercial grade 'A' frame picnic tables will withstand the toughest usage the public can throw at it and more importantly the toughest weather conditions that Victoria has to offer. These are all very solid timber tables and are made from either treated pine, ironbark or red gum in larger cross sections of timber (up to 75mm thick - our default tables are built from 45mm thick timber) - we don't tend to build in lighter gauge material. These types of solid tables are ideally suited to damp areas, forests or parklands where they can be left unattended. They are therefore extremely low maintenance and we expect them to last for years without any form of maintenance. Every solid timber table has heavy duty bracing and galvanised bolts and bugle head batten screws throughout to ensure the tables retain their strength and looks. Our aim is to give these tables longevity with minimal effort after assembly. Seats and table tops are top sanded and edges are chamfered to avoid splinters and extend a degree of comfort whist retaining a rustic look. Obviously the choice of timbers, timber sizes and overall table sizes is totally up to you and we are happy to discuss and manufacture to your requirements. We also have a range of heavy duty outdoor furniture made from sleepers. Whilst most people would associate a picnic table as an 'A' frame this is not the case with us. We manufacture a very large range of alternatives. These solid picnic tables on the right are made from 15 sleepers each and commonly used in parklands and reserves. Defining solid and heavy duty when it comes to heavy duty tables. TK Tables makes heavy duty strong timber tables for domestic and commercial clients. They are used as park tables and outdoor timber picnic tables. Click on the tables tab on the left menu to see many more examples and illustrations of solid picnic tables and other solid timber tables.